Enhanced Abilities: Dex-Star has enhanced strength, agility and endurance due to his Red Power ring. Red Power Ring: The Red Power rings use red energy, supplied by a power battery, which in most cases takes the form of red light. The power ring can be used to fire blasts of rage energy. This power is unique as it takes the form of rage-energized blood. The power ring can project this blood from either the mouth or focused through the ring. This blood has the effect of bursting into flames of rage, these flames burn even in space and are so powerful as to burn through the energy auras of opponent ring wielders and corrupt their power rings, depleting them at an accelerated rate. After ingesting Rankorr's blood, Dex-Starr has obtained the ability to create energy constructs with his Red Power Ring. The weapon's power is more an indication of the rage of the user, rather than his will power. Flight: By the manipulation of anti-gravitons and directed molecular movement, the Red Lantern ring allows the user to fly at incredible speeds. Claws: Dex-Star possesses a set of claws, which he can use as a weapon. Dex-Starr's real name is Dexter and he was an ordinary house cat from Earth. He was abandoned at and later adopted from the Brooklyn Animal Shelter. His new owner loved Dexter because he was always there to keep her company. She believed that Dexter made her life a lot better, and that he would say the same thing too if he could speak. One evening someone broke into their home and Dexter attacked the burglar. As the burglar screamed in pain, Dexter's owner woke up and called for help, but help never arrived. The next day, two police officers outside the apartment discussed the burglary and how it had gone wrong, as Dexter sat outside the door. The police kicked Dexter out saying that the cat would contaminate the scene (apparently unknowing that Dexter was a resident of the apartment). Dexter was left homeless for an unknown amount of time, living in a box on the street when two thugs called him out and placed him in a bag. To their amusement, they decided to throw Dexter (while still inside the bag) off the Brooklyn Bridge too see him drown. 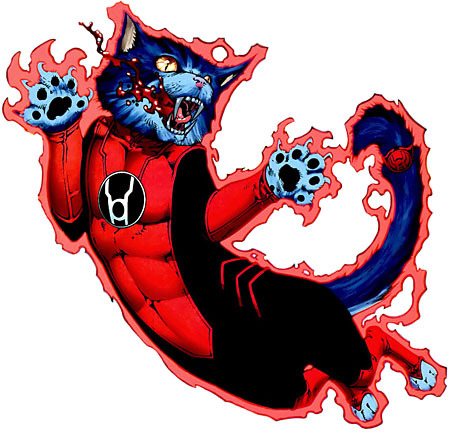 Just as they threw him into the river and discussed whether or not he would die on impact, a Red Power Ring flew in detecting the rage in his heart and turned him into a Red Lantern and thus he embraced his new identity as Dex-Starr, one of the most brutal and vicious Red Lanterns.